Federico Brugnoli talked about the value of sustainability in the footwear supply chain during the retail conference in Hong Kong, APLF 2017. Sustainability and social responsibility is something that is on top of many companies’ agenda’s and we can learn from each other. We hope you can learn something from this article and let us know what your company does to work on a sustainable future?! Federico is the CEO of SPIN360 and sustainability consultant for the Italian footwear manufacturers association ASSOCALZATURIFICI. SPIN 360 is a Consultancy company, based in Italy, specialised in the development of Sustainability projects in the international Fashion and Design industry. In the last 10 years there has been a fast increase of different requirements distributed through the supply chain, mainly through specialised audits and controls. As a consequence of this, the “Ecolabel Offer” has exploded. RISK = PROBABILITY x CONSEQUENCES . 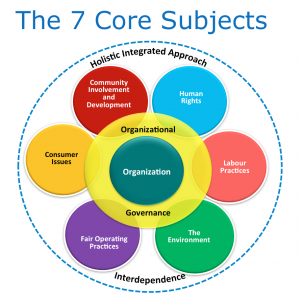 These core subjects are divided over 37 specific issues by ISO 26000 , not all are relevant for each company. I go to see every day some websites and sites to read posts, but this web site gives quality based posts.